The spirit of the Wild Woman video. Click here. 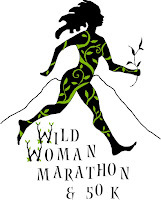 Join us for the 8th annual Wild Woman Trail Marathon, Relay, and 50K! It is a trail run created by and for women. We invite you and your girlfriends to join us for an endorphin filled weekend. Come for the ultra, the marathon, or the relay! Stay for the weekend if you'd like at our Mt. Adams base camp. Bring your tent (or RV) and your friends. Wild Woman Marathon has all the ingredients for an untamed weekend: good trails, good food, and great women. We live (and run) up, down, and even around the base of Mt. Adams (a 12,276-foot volcano). For the past few decades, long runs have provided us with an opportunity to reconnect with girlfriends from Orcas 50K to Mountain Lakes 100, Smith Rocks 50K to Javelina Jundred. We've traded life stories over plates of pre-run pasta and post-run pinot gris. We decided it was time to return the favor, and hold a women's trail run in our backyard and invite gals from all over to run with us. Not everyone wants to run a marathon or an ultra, so that's why we are offering a relay with legs ranging in difficulty and distances of 4.6 to 8 miles. Come find your inner wild on the flanks of Mt. Adams.